This is it for Mawan.Thats it! There are so many other BN parties to choose and going national is an option The decisions will have a major impact on Sarawak politics. Lets just see the credibility of this article.Mere speculations. Todays Borneo posts has also Najib saying that PPP will not have any impact on State BN equation. He went on to say that PPP that the Sarawak based component parties will be the major dominant force.However he said that the Sarawak parties have any grouses they could bring it to the Barisan National Supreme council. What makes the 5 legislators know what the BIG DEAL is because they have to gauge it carefully or else in the next elections their place will be taken up by some new faces . Najib did say the Sarawak coalition parties remain dominant. But can the factor surrounding Raymond Tan of SAPP joining Gerakan Sabah sway their thoughts? Or could this words by Lim Keng Yaik,”politics is very interesting and challenging in Malaysia.My thoughts and feelings could make a difference. I intended to make a difference. PRS will be wary of the new additions as they will be going for their TDC in May says an Emeritus Professor. Another remark which had some of us in deep discussion was a Malaysiakini report which had this ,” Sarawak PKR leader Augustine Liom wants Dayaks in Barisan Nasional (BN) to join Pakatan Rakyat to change the state government.” Either its another laughter in the rain or PKR Iban leaders have suddenly got the courage to speak up to start another,”Dayakism revival in a different platform” through PKR. He went on to say this,”“The Dayaks now need a national party as their political vehicle. Sarawak National Party is nominally alive. 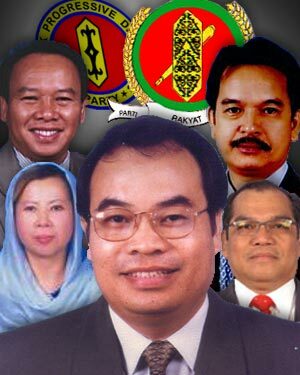 Parti Bansa Dayak Sarawak is dead and gone. Malaysian Dayak Congress has not seen the light of the day. “What we need is a political vehicle, that is PKR, and we need Malays like Anwar Ibrahimright) to champion the Dayak cause, not Malays who will divide us or who will rob us of our NCR land. Neil Sedaka says,” I call it laughter in the rain.” Can the Dayak leaders and political boys see this happening..?? Even Wan Azizah the PKR President has this to say,’“If we want to change Sarawak for the better, then it is now or never.” She could not be saying this is all “laughter in the rain could she..?? We say as always,”Sometimes singing a song or two will ease the tensions that has descended upon the Political Landscape in Malaysia..Of course,you and i know politics is REAL and it cannot be laughter in the rain could it..?? Our own correspondent Bugi Wijaya of audie61 filed this report . The visit by the Prime Minister of Malaysia Dato’ Seri Najib Tun Razak to Sabah has been creating some ripples in the Sabah political pond. While some of the amphibians choose to observe from the side there were a few that were hedging their bets on the game of political power muscle ala Russian poker style. In case you are not familiar with Sabah politics, its called as “The Land Below The Wind” for good reasons. Here although the people are not that politically matured as their counterpart from Peninsular and Sarawak (as mentioned by some strong Pakatan supporters because Sabahan kept BN on the 8 March 2008 GE) but they know their rights. After all Sabahans has gone against the Federalism a few times since the early days. Sabah politics is like the tag line of Nike “Just Do It” and its here that anything goes. So it was the issue of ex-SAPP Deputy President Datuk Raymond Tan Shu Kiah’s position in Chief Minister Datuk Musa Aman’s cabinet that has been hogging the limelight in recent days. It started with the call by BN’s LDP Deputy President Datuk Chin Su Phin calling for Musa to drop Tan from his cabinet citing Tan as a partyless independent state assemblyman. The call was timed to concide with court case of the Mazu statute suit brought by former LDP President and CM Tan Sri Chong Kah Kiat against Musa. Many had said it the start of the downfall of CM Musa. Although being component party and colleagues in the state administration, the state BN parties followed suit with similar call. Is this a move to shake CM Musa administration or is it really Raymond Tan they were after or the DCM post? As speculations mounted that CM Musa had asked Tan to join a component party to hold on his position as DCM, the question which party came to mind. LDP says they welcome Tan but yet their action were akin to hostile to Tan and his supporters. PBS and UPKO similarly welcomes them but statements from them were not friendly either. PBRS has no comment being a Murut based party. MCA state leader Datuk Edward Khoo had even boasted at a function as late as last Saturday that even if party president (Datuk Ong Tee Keat had met Tan in March with some advises given to Tan) agrees, and the state MCA divisions agrees, Tan would still have to go through him to join MCA. As the seconds ticked and everyone eyeing the DCM post come Monday on PM visit, it is like a Russian poker game. LDP had a straight, PBS and UPKO each had a three of a kind and a flush, PBRS with no hand and Sabah MCA with a Full House. As Tan voiced his displeasure on how could he join in a party which has been hostile to him and will make his mind on which party to join in due course, MCA Sabah suddenly went on a pr campaign for Tan. A few division head including state deputy chairman Datuk Paul Kong who is a Sarawakian (that’s why Sabah is a good example for PM’s 1Malaysia) had came out in the press welcoming Tan to join them. There was still no official state by state chairman. As the seconds ticked away and even before the dust had settle on PM visit, when it was show-hand time it was Gerakan which had a ROYAL FLUSH! As a humble and quiet Tan Sri Koh Tsu Koon announced in the morning prior to the PM meet the people session at the state padang Merdeka, that Tan including ex-SAPP youth leader Au Kam Wah will join Gerakan. Thus, overnight from a really “mosquito” national party in Sabah, Gerakan had manage to upstage the rest including UMNO no. 1 partner MCA. Gerakan now has a Deputy Chief Minister post. With support from their ex-SAPP supporters, Gerakan will be a new force to reckon with their multi-racial approach. Thus the real winner now is Gerakan. 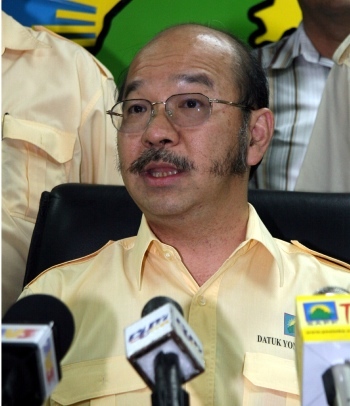 Another winner could be CM Musa advisor Datuk Tham Nyip Shen. Tham who is a former DCM and ex-SAPP deputy president, has always been a level headed and action oriented leader. It is a well kept secret that he is a good strategist and executor of political strategy and thinking. We say as always,”Sabah politics is really like a roller coaster. You will always be looking over your shoulders as it might just turn overnight. Tough..! Pressure to Leave..! Hand Over Resignation letter..Its a wretched political life if you have crossed PARTY LINES. Believe Me, I know that too…Suddenly the attack is INCESSANT and its not only coming from SAPP but also MCA. This Malaysiakini report http://www.malaysiakini.com/news/90744 whereby Donald Lim was told bluntly by Tham Nyip Shen a former deputy chief minister who recently quit Sabah Progressive Party (Sapp), described Lim as “rather arrogant” for asking that the DCM post be reassigned to Sabah MCA head Edward Khoo and for the party to be allowed to contest 10 state and five parliamentary seats. Where is Donald heading with his statement? Its a very BOLD APPROACH as he sensed that there is a need for less political parties in BN. Its a BREADTH OF FRESH AIR but he needs to REFINE AND SUBTLY bring it up to the BN Management committee instead of “letting loose his tongue“. This approach in these dire times will incur the wrath of not only Sabah parties but everyone concerned in Sabah. Politics have a very funny way of putting together bedding partners.It seems that the word “Machiavellian” comes into play. Those who prescribed to Machiavellian politics are good or very realistic. They know how to capitalise on and use situations and people for furthering their political careers. They are not frightened of crisis and take it as an OPPURTUNITY. The English will say,”You have to break the egg to fry an egg.” while the Malays would say,”Dalam kesempitan ada kesempatan.” So Raymond and Donald had all of you crying out loud,” HEeeeeeeelp..!!!! It has been a very tumultuous week in Sabah politics and Bugi Wijaya has filed this report. In the Malaysiakini report The BN doesn’t ‘get’ the Internet by Ong Kian Ming http://www.malaysiakini.com/news/90024 , I discovered that Deputy Minister Of Entrepreneur and Cooperative Development, Dato’ Saifuddin Bin Abdullah has a blog at note “Paparan terbaru di blog saifuddinabdullah.wordpress.com“. What make it interesting is the comments make by some in his notes in Facebook promoting his blog. You will have to read them….hehehe to know what I mean. Sabah..! Oooh my Sabah its disintegrating,the “War Of The Show Power” between SAPP leaders and Datuk Raymond Tan expand to Tan’s CLC Tanjung Papat where 2,000 member from 15 branches quit the party. See http://www.malaysiakini.com/news/90106 for the full story. It is ironic that ex-youth chief YB Au Kam Wah members form Elopura CLC has not make any public announncement while there is no news yet on Chief Minister Political Secretary Jimmy Wong’s branches. The Youth Exco under new Youth Chief Edward Dagul would meet tomorrow. It is believe dthat in the meeting, they will declare their support for the decision to withdraw from BN. Definitely missing from the meeting would be the youth chiefs from Tanjung Papat and Elopura. I wonder why when one talk on the handphone in the restaurant, its always so loud. This was what happen during dinner tonight. The phone rang and there was this man (I think he must be deaf as he spoke so loud) that was three tables away. As usual, the conversation is politics. The topic of the day was …..zeng….zeng…zeng….. SAPP Pullout From BN. He was said that BN is gone and if the general elections were to be held in the near future, BN would be wipe out. Anyway back to my dinner table, Kong my MCA friend disagree. He says that BN has a track record and has been consistent in bringing development to the people. The only blimp now is the wrong use of ISA recently especially against journalist Tan Hoon Cheng. Asked on PM, Kong said its up to UMNO themselve to sort it out. What can DSAI do for the people? I reminded him on the petrol price hike which has sent everything to increase in price! He reply, “hey, thats why I am paying for this dinner”. These short exchange reminded me of a photo I received by email. Its a electrical post which acts as a lamp post too. The post is like BN and has been there for a long time. It do not light up any more at night (no more shinning light for the people). The post is broken and rusted at the mid point. 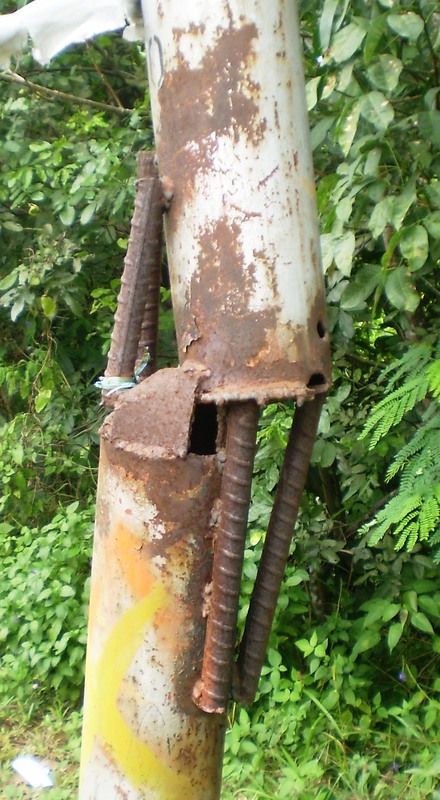 What the authority did was some welding to hold the post together. The core has been eaten by rust (UMNO, MCA, MIC besiege with problems) and the support is from the metal pieces welded in (other component parties are supporting it). Now wouldn’t it be better to just put in a new pole (Pakatan)? Then there will be disruption in constant electricity supply. Would you bear the inconveniences? So what would you do? Weld some more metal rod to strengthen the post or change a new pole? The choice is yours. Malaysiakini portal carried the full report http://www.malaysiakini.com/news/89641 which carries a very serious political message for BN as it was headlined:SAPP may pull out of BN on September 17th. Cindy our correspondent covered it through sms to us this afternoon at 12.35pm. Bugi Wijaya seeing that there has been too much “TENSION” in the country said that what and how YTL put it over the mike when questioned had him nearly falling over in stitches. This one the Sharkman was in his element,” No need to wait seven days.TODAY also can SUE me. TAK payah bagi Bung Mokhtar tunggu tujuh hari untuk menarik balik apa yang saya cakap.” Bugi said that he had asked Datuk Yong on the call by Datuk Bung giving seven days to apologise for the allegations of each MP was given RM$50000 for the Taiwan trip. He said his statement must have meant for the costs of the airfare,hotel expenses and other expenses for the MPs. You want to hear more.Don’t worry when they summon me in the Court of Law,we will through the courts exposed the whole fiasco of the “Taiwan” trip. That’s good enough don’t you think for appertizers…Bugi..? With all the uncertainties hanging around in MALAYSIABOLEHLAND “Sharkman” Yong still managed to put some smiles in the faces of the journalists who covered the PC today..